Mais un événement imprévu va la forcer à prendre une décision. Et elle choisit : la panique. Et la fuite, au volant de sa voiture. Tout plaquer, pour jouir de sa liberté, tant qu’elle le peut encore. Monique a la soixantaine, et autant de complexes. Plus de mari, des enfants partis vivre leur vie, aussi s’est-elle résolue à finir la sienne en tête à tête avec son chat. Mais la solitude, c’est d’un ennui… Alors, quand son amie Lutèce propose de la convier à une soirée de célibataires, elle accepte. Etait-ce une si bonne idée ? 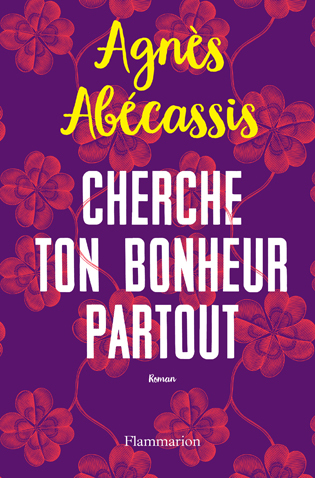 Cherche ton bonheur partout, éditions FLAMMARION. Regine and Tom love each other. Besides, they live together. Almost. Nearly. Let’s say, they are dating. Well, dating is not the right word… Where is exactly their relationship, when Tom wants to get involved and Régine refuses ? But an unforeseen event will force her to make a decision. And she chooses : panic. And escape, driving her car. To dump everything, to enjoy her freedom, as long as she can. Until she’s caught by the worst jars of glue : Olga, Tom’s mother… Monique is in her sixties, and she’s full of complexes. No husband anymore, the children gone to live their lives, so she resolved to finish hers alone with her cat. But loneliness is boring… So, when her friend Lutèce offers to invite her at a blind date, she accept. Was it such a good idea ? Love, it’s not easy everyday. But happiness, you have to look for. Everywhere.